This is a twist on the classic roast chicken recipe, perfect for family dinners or a Sunday roast. In a bowl combine the butter, chilli, garlic, ginger, ground coriander and fresh chopped coriander with a pinch of salt and pepper. Gently lift, but don’t remove the skin off the chicken breast flesh, then using your hand rub the flavoured butter under the skin, rub any remaining butter on the chicken skin. Place the chicken in a roasting pan and insert the lemon in the cavity of the chicken with some herbs. 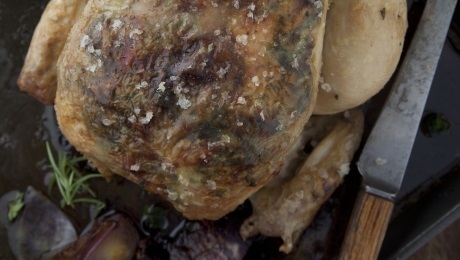 Roast for 1 hour 30 minutes until the juices run clear when the thigh is pierced with a skewer. Baste occasionally with the flavoured butter. Remove from the oven and stand for few minutes. Serve with mash or champ.